I've create a empty file named user_profiles_disabled. I've restired cue tools folder. I've upgraded a 2.1.4 version to 2.1.5 by overwriting files. 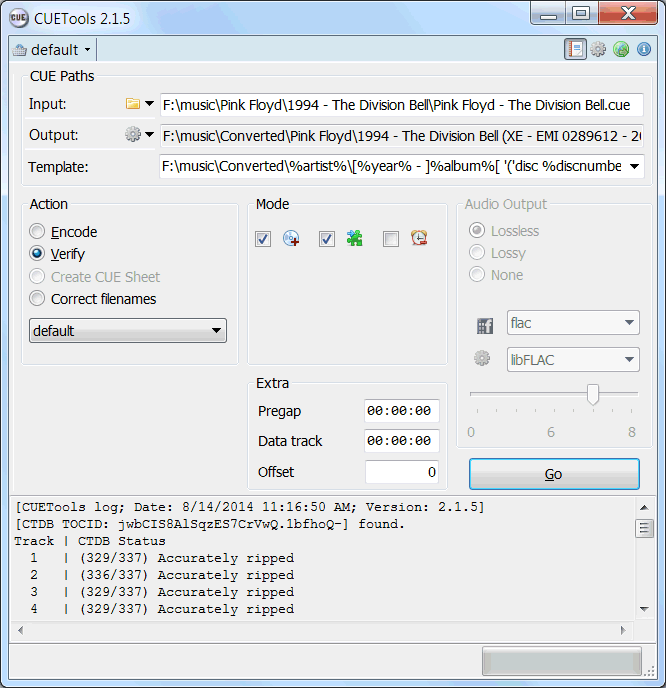 FYI, CueTools includes CueRipper which according to Hydrogen Audio is on par with Exact Audio Copy (see http://wiki.hydrogenaudio.org/index.php?title=Comparison_of_CD_rippers). Being a DotNET app, it is native to both 32 and 64 Windows. Also, there's v2.1.5 Beta available for download at CueTools' site. I've update the listing to use the Visual C++ 2008 runtime libraries. Thanks Magibon! Instructions: Delete user_profiles_enabled in the app folder, then launch Cuetools.exe. Now settings are stored in the app folder for CueTools and CueRipper.